The Secret Recipe Club challenge is a great way to meet new bloggers. This month, I got to read more about Carrie who blogs over at Carrie’s Sweet Life. Carrie has just become a mum for the second time – congratulations! Their dog Peanut is too cute as well and could be a sister to our two Jack Russells who look so similar. This month I did not have time to waste as we only got back from Scotland on the 7th of May and that meant finding a recipe, shopping for it, making it and blogging about it in 2 weeks. I have to admit that I took the easy way out to make sure I could take part in this month’s challenge and I used the search function on the blog (which worked brilliantly) and entered pasta. It has been so long since I have taken part in Presto Pasta Nights that I decided to kill two birds with one stone so to say. 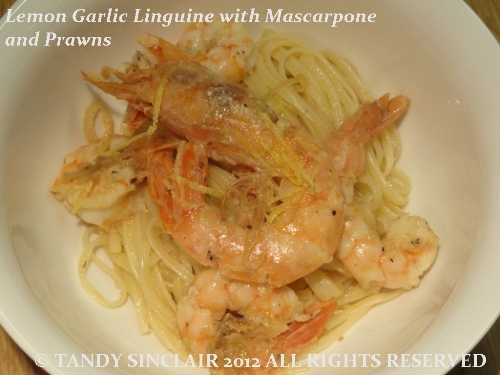 The recipe I chose was Lemon Garlic Linguine with Mascarpone and Shrimp. This is where things got challenging. On the 8th of May I printed the recipe, and attached it to my fridge. Due to a writing deadline on the 15th of May, I did not look at the recipe until the 18th. Early in the morning I read through the ingredient list and added what I needed to my shopping list. I got home after work and took some very large prawns out of the freezer. I had invited my friend Erica for dinner and as she was running late, I decided to get everything ready so that we could eat shortly after she arrived. It was then that I realized that some of the ingredients did not feature in the recipe method. This meant guessing where they were meant to be added, if at all. Even more difficult was that in the method there was mention of several ingredients that weren’t on the ingredient list, and so with no measurements I had to improvise. I could not add the chives which were in the method part of the recipe, as by the time I started cooking it was dark and raining and I did not feel like going to the herb garden. This would have added some colour to the plate which would have made for a prettier picture. However, despite all these issues, the meal got a thumbs up, which was a great result. I emailed the challenge to myself early this morning – not sure which dish I am going to link, but this one does seem good! Looks amazing! I am soooo wishing hubby wasn’t allergic to prawns right now 🙁 Guess I could make with chicken, but it just won’t be the same. Those prawns are drool worthy!! 🙂 Great choice for SRC! I think you might be about to convert me to start enjoying my kitchen. I’m going to try and cook one new recipe a month! Terrific dish! I love every single ingredient in there. Thanks for sending it over to Presto Pasta Nights this week. It’s only breakfast time, but I’m drooling for this. I love how you made it work even missing ingredients & instructions. Now to see what I have on hand to whip up something similar. Thanks for sharing with Presto Pasta Nights. This looks delicious. When you said that you didn’t feel like going to the herb garden I could so relate. Some days are like that and it is good to tell ourselves that it’s okay! What a pity about the incomplete recipe ingredients and method. Fantastic result – it has been forever since we had prawns – time to remedy that! I have half a box left over waiting …. I love lemony pasta sauces and the mascarpone makes it so decadent! great dish. This dish was really lovely, the prawns were super fresh and the use of linguine was spot on. Will eat this one again without hesitation, thanks so much for sharing Tandy! Mascarpone, prawns, pasta….love. Nice choice for SRC! Rich and fresh, gotta love it. I’m addicted to prawns. This looks beautiful! I love the use of the mascarpone! I had Carrie last month! She’s great. And this looks great too!!! Well done! So glad to be in the SRC club and to meet great foodie bloggers like you! I’m Italian, so naturally, this recipe has my name written all over it. Oh, and that mascarpone cheese…how fancy! Love it! You certainly don’t need chives to make this pasta look mouthwatering. The Prawns say it all and it hasthree of my fav ingredients, cheese, garlic and lemon. Great flavors, and bet adding that marscapone makes it nice and creamy. Yum! Looks really delicious! I think you should name yourself The Queen of Pasta!